Tiki Torches clearly must be incorporated into any plan to create a Tiki Island Life. They are generally inexpensive, easy to incorporate into the tropical decor and are just plain cool! They are simple to use as patio lanterns around your tiki hut, tiki bar or generally part of the luau decorations to consider for that Hawaiian themed party. While they look cool anytime, they are obviously most striking when lit after dark. They give an enchanting sense of primitive intrigue, excitement and adventure. The Tiki Torch, as did the Tiki Statue, came from Polynesian culture. 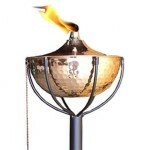 They were said to represent fertility, and were used in homage to the goddess of fire and night. In America, their roots can be traced to The Tiki Torch Corporation which, in the 1930’s, sold Tiki Torches made of metal. With many other manufacturers beginning to produce them, they soon grew in both variety and use. While they peaked in popularity in the 50’s and 60’s, Tiki Torches are still very popular, and available just about everywhere. Today they can be had in many different configurations from simple pole-mounted torches intended to be inserted into the soil to relatively elaborate table-top units. They can be made of bamboo or many other materials, including stainless steel, and can be fueled with everything from oil to solar power. The classic Tiki Torch,- the one most people think about when the term is used, is a 5 foot long piece of bamboo with a point on one end to allow stabilization of the torch in the earth. Since bamboo shafts are hollow, the point is similar to a larger version of an injection needle. At the other end the bamboo shaft is sliced into several thin strips allowing each one to flexibly expand large enough to hold the metal oil canister, which is then wrapped tightly to hold it in place. The top of the canister has a screw cap through which the wick extends to a desired height (depending on how large a flame is required). The other end of the wick obviously extends through the hole in the cap down into the fuel oil. Pretty simple, really. These torches really give a lot of bang for the buck. They are quite durable (assuming care is taken in their use), replacement wicks are cheap and there really isn’t much that can go wrong with them. The effect they are capable of producing, however, can be startling! The only negative thing about them (and it is quite minor) is that they can be somewhat fragile. The bamboo shafts are usually somewhere between 1 and 1.5 inches in diameter. They can be brittle, especially if one is thrusting with a twisting motion to insert them into the ground. They will sometimes split along their length which, if it extends far enough, ruins the torch. A simple solution is to make a pilot hole with an old broom handle or dowel with a sharpened end, and then insert the Tiki Torch. 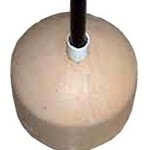 The ground can then be closed around the shaft to hold it securely without any breakage. Another thing to consider is the “snuffer” attached to almost all Tiki Torches by a cord, string or thin strip of bamboo. It is a small cap (usually made out of bamboo) which is used to extinguish the torch flame without having to huff and puff and hyperventilate. 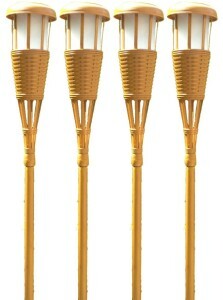 If the torches will be left outside, it is important to leave the snuffer caps over the wicks. If it were to rain, moisture could infiltrate the wick making it very difficult if not impossible to light until it dries out (which can be a long time). elegant. Some are just a bit more expensive, and others can really be a bit pricy. It really is a matter of personal taste and the type of outdoor lighting effect for which you were hoping. I tend to like the classic bamboo just because I like the way it looks (and it seems more traditional), however if you find one of the metal ones that you really like I believe it would make a good investment. Once purchased, barring any sort of physical insult (for example getting smashed during a particularly rambunctious luau), they should last indefinitely. the nearest area in which a traditional Tiki Torch could be placed is quite a distance away (outside, for example). Outside the area of the party, the torches would make very little impression on your guests, and their beautiful ambiance would go to waste. With Table Top pieces, the problem is solved! They can be placed where ever you wish to enliven the atmosphere. at night, often with a very realistic flickering flame effect. 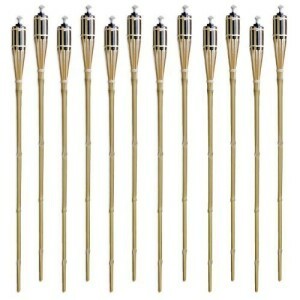 Obviously, they are even simpler and easier to use than traditional Tiki Torches. It is worth noting that after some time, especially if left outside, these torches may begin to fail. When that happens, many consider the most likely culprit to be the battery. That may not be the case. Rechargeable batteries do eventually fail, however most have a reasonably long service life. More often there is a problem of conductivity in the battery compartment. The remedy for such a problem is simply cleaning all contacts (battery and connections within the torch) with fine steel wool, alcohol on a cotton swab or even a rubber pencil eraser. For stubborn cases you might want to try all three. To help ensure that problem does not occur (or does not occur again) it helps to cover all connections with a thin layer of dielectric grease, specifically made to improve the quality of electrical connections and prevent corrosion. In addition to the more traditional, life-sized tiki torches there are also miniature tiki torches. Miniature tiki torches are even smaller than table-top units. Although a bit hard to find, they can make a very interesting novelty to provide a “finishing touch” for your party or gathering. A typical use might be upon a tropical, tiki-themed cake or desert. Your guests will be pleasantly surprised and likely express that you’ve “thought of everything!” They can also be used for miniature displays, for decorative purposes (in the same way people often keep a small container with sand and some sea shells to pleasantly remind them of a favorite beach or exotic locale). FINDING miniature tiki torches is the tricky part. A simple internet search will usually yield some results, however mostly what are available commercially are small candles with images of different tiki masks on top. 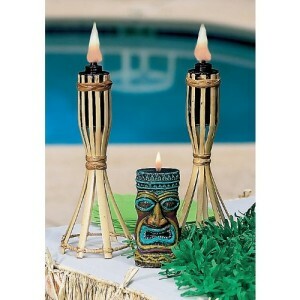 While they look great, they are not really miniature tiki torches (they are more like miniature tiki-mask torches). While you could continue to look online, an easy solution might simply be to make them yourself. 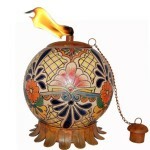 Nominally priced plans are available describing how to make miniature tiki torches that look just like the real thing. They are easy to make and would certainly fit the bill for either miniature decorative displays or to adorn a cake. The plans are available here. In addition to the Tiki Torch items already discussed in this post, there are some things that may offer even more options for using these wonderful flaming symbols of Polynesia. One is a mounting bracket for securing a Tiki Torch when there is no option to put it in the ground. Suppose, for example, you normally use Tiki Torches outside and never purchased any tabletop units, however you’ve planned a soiree on your patio and wanted to use them. The mounting bracket is just the ticket. 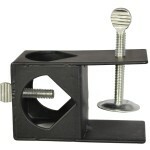 It can be mounted to any horizontal table or deck rail, or to any vertical posts. You simply slide in the Tiki Torch and secure it with a screw. Neat, huh? like the mounting bracket), however the concrete base can be moved anywhere, with no need for railings, tables or anything else,- completely independent! Just like the tabletop units, a torch in this base can be placed alone or in groupings to create the exact effect you are going for. Of course one could always use a bucket of some kind, and simply secure the Tiki Torch with sand, rocks or some other medium of substance, although that might be just a bit cheesy. After all, part of creating your Tiki Island Life is structuring the environment thoughtfully in ways consonant with the tropical lifestyle you envision. An old bucket probably wouldn’t fit that too well (unless, of course, the bucket was an attractive “Tiki Bucket”!??! ).